1 of 2 Heat oven to 400 degrees . 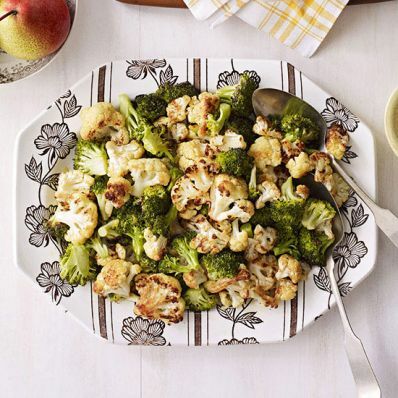 In a large bowl, toss cauliflower and broccoli with 3 tbsp of the olive oil, 1/2 tsp of the salt and the black pepper. Distribute over 2 rimmed baking sheets in one layer. Roast at 400 degrees for 15 minutes. Stir and roast 10 minutes more. If roasting at the same time as the Brussels sprouts, swap racks. 2 of 2 Meanwhile, heat remaining 1 tbsp olive oil in a saute pan over medium heat. Stir in garlic and both paprikas; cook for 2 minutes. Scrape into yogurt and season with remaining 1/8 tsp salt. Drizzle veggies with spicy yogurt sauce.